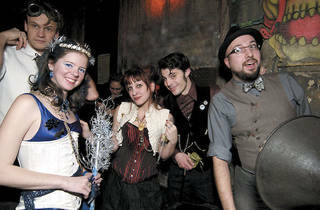 Thanks to Joseph Vourteque IV and Steampunk Chicago, Chicago is making its own unique contribution to the steampunk scene. It sounds like a dream. Airships rule the skies. Inventions the likes of which H.G. Wells imagined assist you daily. Men are Lords and women are Ladies. Corsets, gowns, frocks and pilot’s goggles are all the rage. It’s like a blast from a Victorian-era past, and yet it’s 2011. Welcome to the fantastical and endlessly intriguing world of steampunk. An offshoot of Goth subculture, steampunk builds on the romantic notion that technology has never progressed to the use of petroleum-based fuels. It has adopted much of the look of that period in industrial history, specifically in Britain, with sci-fi embellishments. Emerging in the ’80s, today it draws healthy crowds to conventions—cons—all over the country to discuss their fashion, technology, literature and entertainment. 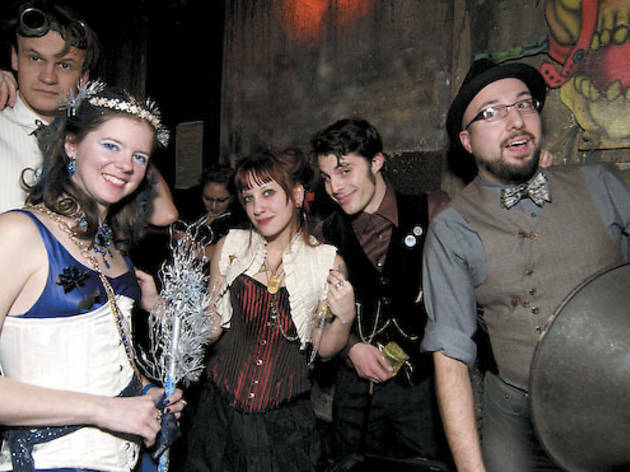 While places as close as Madison, Wisconsin, and Detroit have had thriving communities for some time, steampunk has only taken root in Chicago in the past year. This is in large part thanks to Steampunk Chicago, and its principal founders Joseph Rovner, a.k.a. the Lord Baron JCR Vourteque IV, and Sam Perkins-Harbin, a.k.a. the Reverend Captain Sam Flint. In advance of Gearbox Fantastique, the group’s one-year anniversary circus extravagana at the Abbey Pub on Friday 18, I shared a couple of drinks with Rovner, 30, and his girlfriend K.L. Kenzie, 32, at the Charleston, where the couple also hosts the Gaslight Sessions, a monthly steampunk soiree. Although fashion plays a large part, it was the musical side of steampunk that truly wowed Rovner and Perkins-Harbin. After adapting their wardrobes and building a few props—elaborate modifications to everyday items that steampunks call “mods”—the two started attending cons in 2009. “The thing that really struck me was the dance party,” Rovner says of his first impressions. “The DJ played this crazy mix of industrial, neo-cabaret, vaudeville, soundtrack—things like Moulin Rouge—and it worked. I came back and am immediately thinking, we need to bring that to Chicago.” With a degree in film and screenwriting from NYU and a history of promoting raves and DJ events, Rovner was instantly drawn to the idea of combining the two. Gearbox Fantastique takes off at the [node:31851 link=Abbey Pub;] on Friday 18.